Ok, a lot of articles how to choose and what to keep in mind to purchase press brake tools. Now this is the time to tell how it could be easily broke or defected. First thing to know from the customer side - normally press brake tools are investments for years. Nobody can tell you the real duration of life to use but it really could be years depends of all circumstances you have during the bending process. Normally it is also possible to provide the guarantee, why not, but it is just not typical in tooling practice because everybody knows that tooling is the subject of wear and tear. Anyway it could be really long period of use, thousand of bends and even normal condition after it if the caring about the recommended conditions will be performed. Why important to follow all recommendations? It is very easy - damage of the tool is the reason to replace the tool completely and to purchase the new one. But even small damages and scratches are the problem because they will effect result of bending in terms of precision and quality of surface. Even small defect will be the reason to see the problem on the final part. It means - for example, operator didn't realize the small damage of tools and continued to work several days and, finally, as the result production has hundred of defected parts. The second importance. The purchased tools, for example, were made with special geometry and the cost was twice or triple than standard. The defect for this type of tool means more expensive for production to replace. To care about the adherence if to work with aluminum or zinc plated sheets. This will effect for the fast and accelerated die wear and the real remedy is only to order the tools with special coating. The temporary solution - to have near the air blast or air gun to clean the tools during and after the work. Burrs, even small mean that first you bend the burr and after - the bend you need. Burrs are the good subject for high wear of tools and the main solution - manual or automated deburring of sheet metal parts before bending. Lot of companies do not think that small burrs are really important but even small burrs are the problem for high volume production. Storage as the last and simple. Keep your press brake tools clean and properly stored. Yes, you can store them as the pile, do not care about the conditions and corrosions to finally have marked and scratched scrap of metal to bend just something not precision and simple. If the customer cares about his production he should to be care about his tools as well. Unfortunately we met a lot of situations when the tools are stored as the pieces of metal. This is really story from life when the customer several weeks after receipt of new tools started to bend bars. To bend something outside of flat sheet metal parts is the subject for additional study and for sure nobody will give you any guarantee for the process and efficiency of tooling. Moreover the customer bended bars with coining process and after several bends he damaged the bottom of die opening. You should know - the bottom of die opening is outside of working zone for standard air bending process so this area is not hardened also. Moreover during bar bending the force is provided from the top of bar and not distributed like sheet metal bending. Anyway, if such special applications are presented the main reasonable way - to ask the tool supplier and the supplier of press brake about possibilities to make without any risks. Otherwise there are different possibilities to damage. And we should say that in our example the customer was lucky just to damage the cheap die. Tonnage and limitations. Usually sheet metal bending is connected with small thickness parts. For these applications 100 ton, 3 meter machines, so 33 tons per meter and no any problem with the tooling or the machine. And everything changes when the customer wants to make thick material, use the force of press brake in one area without length distribution, work with hard resistance materials or ignores the way of air bending and tries to make small radius started with coining. The results could be dramatically - damaged dies, bended punches with the deflection of the center line, problems with the machine. Any big force activity is subject for study - reason to change the tooling from standard ones to special with more high limits, subject to speak with the manufacturer of the machine and to think double time about all possible problems. There are lot of possibilities to reduce the tonnage like increase of V-die opening so the customer should follow the limits and moreover do not make overloading more than 80% to leave 20% for all possible risks. It is also very important to know. 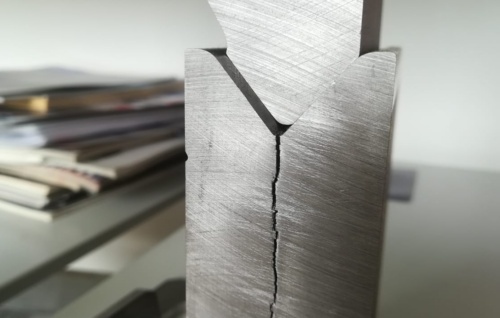 For all main tool manufacturers even high forces bending is the main theory so it is possible to review the possible tonnage to guarantee based on the thinnest area of tool and used tool material. For example for Promecam 100 t/m is the limit because tang width 13 mm only. Ok, it is possible to install heavy duty intermediates. But... there are also bolted clamps, will they be ok for 200 t/m force? Hard to say. So this is the reason to be very accurate with high tonnage applications. And if possible to leave them for big tonnage press brakes and heavy duty tooling from the begin.